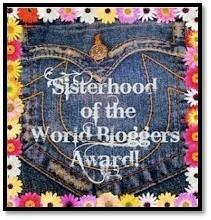 A LONG time ago, I was tagged in my friend, Leslie’s post, over at Once Upon a Time & Happily Ever After for the Sisterhood of the World Bloggers Award. (Thanks Leslie!!) A busy schedule and participation in Write 31 Days prevented me from responding to her questions. Now that the month of October is over, here we go! What’s your favorite physical feature and personality characteristic (of yourself) and why? My favorite physical feature is my hair. Although I used to fight with it back in the 80s (no way could I get rock and roll hair or Farrah Faucet wings) I have come to embrace the fact that I will never have curly hair. My hair is straight, and I can finally live with that. It’s easy to manage (most days), so I’ll take that too. Some people have thin hair, some people have too thick hair, some people struggle with mounds of hair. I have none of those problems for which I’m thankful. My favorite personality characteristic is that I’m pretty organized (when I’m not procrastinating or being lazy). I love to make lists and check things off. Describe your favorite accessory. Shoes, jewelry, purse? Why is it your favorite? My favorite shoes are (since we are headed into fall) my leopard flats because they are symbolic of the new me: willing to try new things as long as it’s within my tastes. They are not what I would usually pick (not safe!) yet they are classy and classic. My favorite jewelry, also classy and classic, are pearls. Real pearls (10 year anniversary gift from my hubby), freshwater pearls (souvenir from Key Largo) or RPBs (“ridiculously blingy pearls” from Target). My favorite purse, currently, is a Fossil brown leather bag that I found at Goodwill for six dollars. It’s the perfect size, with the perfect length straps and two outside pockets that are perfect for holding keys or phone or glasses. If you could have dinner with someone living or dead, who would it be and why? I would have dinner with my grandmother because she died when I was 10 and I miss her. I would love to know her as an adult. For what would you like to be remembered? I would love to be remembered for being a good wife and mother. List your favorite five things in your house. I am currently in love with a cabinet that I painted. It turned out great! Just like a rags to riches Pinterest pin! (Post on that coming soon). I’m also happy with a side table I painted to match the rest of our white furniture. I painted a compass rose on the top. I also really appreciate my Vitamix. It gets used almost daily and most times multiple times per day. My bed. It’s a tempurpedic that was given to us. It is SOOOO comfy! And we still can’t believe it was free! My Italian coffee maker. It’s a simple little stove top percolator but it makes the best coffee. I prefer it to Starbucks! What is your favorite indulgence? Dark chocolate. Watching Gilmore Girls. Popcorn. In what way(s) do you express your creativity? This blog is my latest expression. I’ve also sewn quilts, knit scarves, made jewelry. What do you collect? Milk glass pieces that I find at thrift stores. But not too many. Scarves. A LOT of scarves. Italian coffee pots. I have several in different sizes. One is an old fashioned one that I found at a garage sale. What is your love language, physical touch, words of affirmation, acts of service, quality time (spent with the one you love), receiving gifts? My main gift is quality time. I love to spend time with the ones I love. Time is such a gift and I value it when people give me their time. It’s the way I feel most connected with people. What is your favorite morning and evening beverage? Chocolate or no? Dark, milk or white, if yes? What is a favorite reading genre? Do you like the movies? Why or why not? Bucket list of places to visit? Myers-Briggs personality type? click here for test if you don’t know. Name your favorite dish from the following cuisines: Mexican, Italian, American, French, Asian. Thanks Leslie! I’m finally in the blogging groove. I think the Write 31 Days Challenge did it for me. (Why do I always need a challenge to get something done?) That and being connected to so many great bloggers! The furniture post is coming tomorrow! I’ll think about doing one on the coffee pots! haha! Thanks for tagging me! Working on my post. Is the quote from Gone with the Wind?